ca. 520 - 510 B.C. Side: Iris, the winged messsenger of the gods, commands Achilles ransom the body of Hector. 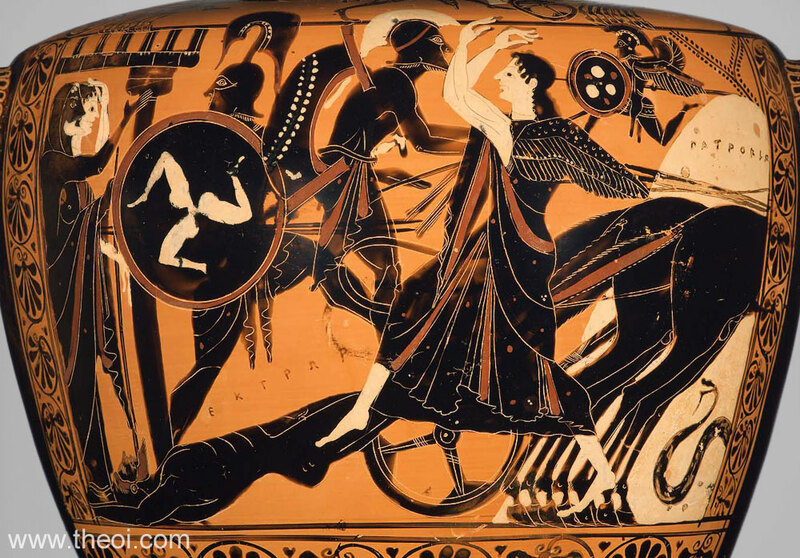 The hero rides a chariot, dragging the corpse around the tomb of Patroclus. Flitting above the tomb, the ghost of Patroclus is depicted as a tiny winged man, armoured and holding a shield. Priam and his wife Hecabe stand at the gates of the city. The striding warrior before them is probably Hermes disguised as a Myrmidon warrior, preparing to lead the king to the Greek camp. The entire scene is drawn from books 22 and 23 of Homer's Iliad. Shoulder: Heracles battles Cycnus (not shown).